And so, with that said – it’s Wednesday and I’m once again linking up with Call Her Happy for the Five Favorites Blog Link Up. As I mentioned in my last post, we were very blessed this year, so it’s difficult to narrow down to only 5 things – I’m also leaving out gifts that KP and I received and just focusing on the kids’ gifts (though for the record, my best gift was my camera and KP’s was probably a cast iron cooking set). Oh, I love this thing. Baby S loves this thing too, even if he’s not totally adept at pushing and walking with it yet. 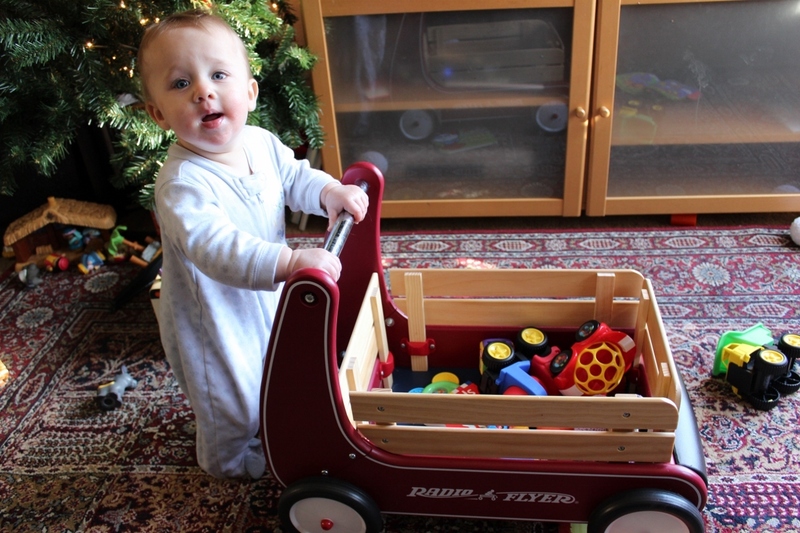 He’s pulling up to standing, and if I take the back wooden piece off, he will crawl into the wagon and sit in there (and then Big Sister C will push him). I love this. I could keep talking about it, but there’s already a bunch of Amazon reviews singing its praises, so I’ll just say that it’s great. For the past several months, my daughter had insisted on going to bed with a flashlight. She likes to read to sleep, and she likes the comfort of a night light. The problem is that she leaves the flashlight on all night, often with it shining into her eyes! If we manage to tiptoe in after she’s asleep to turn it off, she somehow knows and wakes up and cries. Oh and heaven forbid the battery run out! So this little owl lantern has been the perfect solution. She can carry it to bed, it’s bright enough to read by without being too bright, and it has an automatic shut off timer. 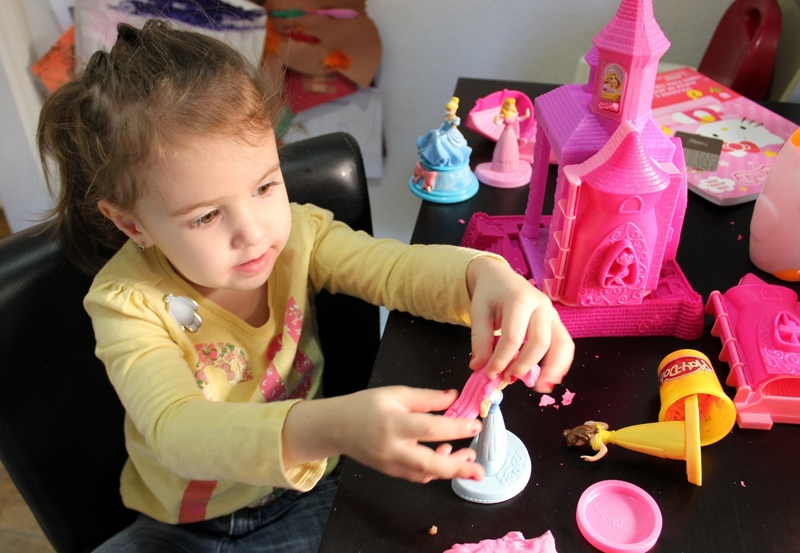 C is totally in both a princess phase and a Playdoh stage, so this was perfect. She plays with this thing multiple times a day. She’s a little too young to really create the dresses, and she gets frustrated putting the sides of the castle back on, but she just LOVES making Rapunzel’s hair by pushing down on the tower. Yeah, Playdoh can get a bit messy, but it’s worth it. This gift was given before Christmas, and thank goodness, because C watched this thing probably twice a day leading up to Christmas and it gave me a little bit of time to get things done. I like that it has a mixture of new and traditional Christmas songs. Even with Christmas over, she is STILL asking to watch this (though I think *I* might need it to go away for awhile and not come out til next Christmas now…). Um, I dont really know what to put here for #5 because there are so.many.other.great.gifts my kids received this year. 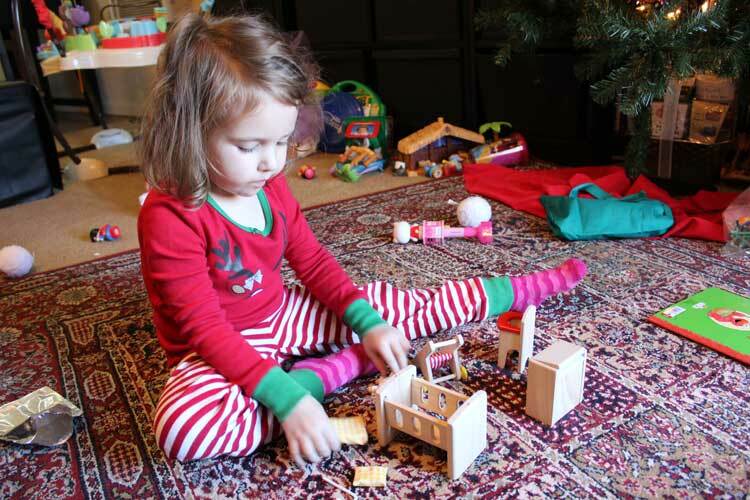 But I will go with this little nursery doll house set, because I love the way she plays with it! She’s so careful with the little baby, changing the crib mattress so she can “wash” the sheets, and pushing the baby for a walk in the stroller, and being very quiet when the baby is “sleeping”. She also loves putting the little mobile in the crib for the baby to look at it. Ok, I’m going to add in an honorable mention here, just because I think more people should know about this. This was a stocking stuffer for KP, bought on a whim from an Amazon Lightening Deal, but it’s ended up turning into something that I can’t believe we ever lived without. Tiny house + one bathroom = sometimes unpleasant odors. But not anymore, thanks to Poo-Pourri! It works and it’s awesome. I’m not going to say much more about it, other than that if anything, you should watch the video on the Amazon page. It cracked me up.